All photography is by Grace Madigan. A participant of the MLK, Jr. Day March on Jan. 21, 2018 flys the flag for Anakbayan-USA, an organization of Filipino youth and students that has chapters nationwide. Photo by Grace Madigan. 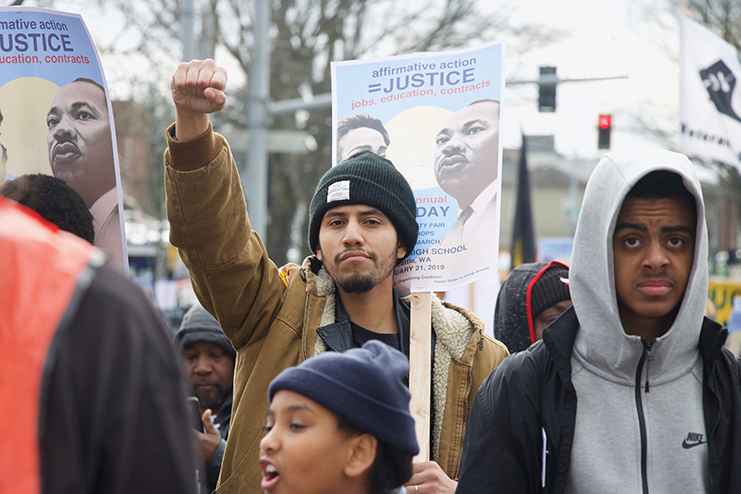 Families, activists, educators and many more gathered in Seattle’s Garfield High School Gym on Martin Luther King Jr Day, January 21st, to rally and march for solidarity, justice and truth. 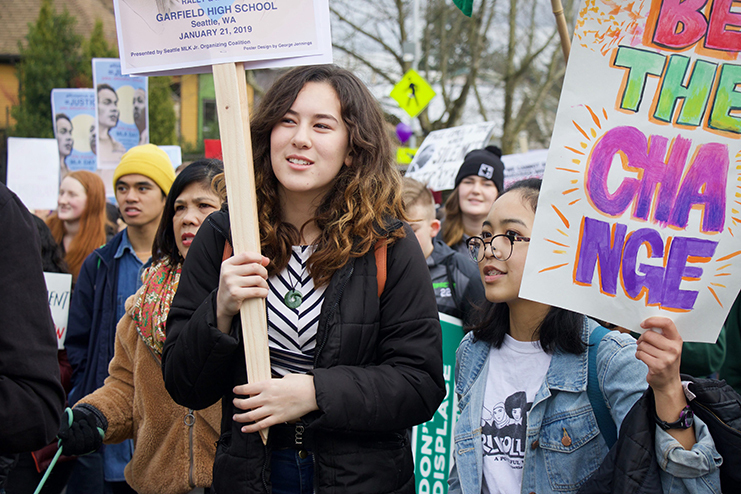 Their rallying cries echoed from the gym and out onto the street, kicking off a march from Garfield High School to downtown Seattle. 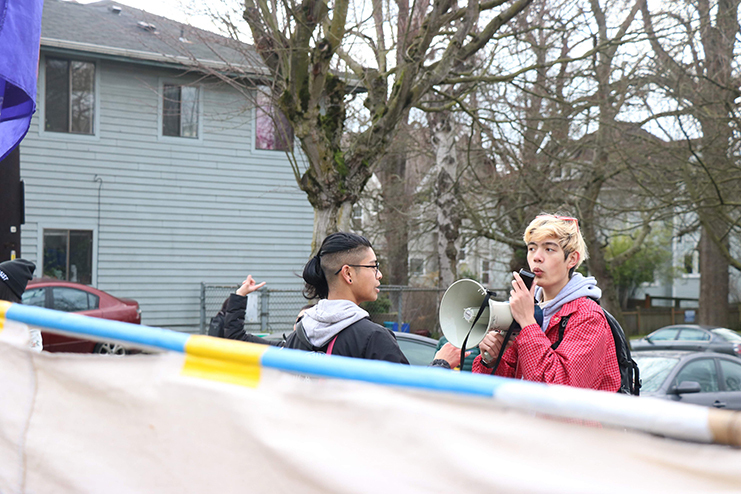 At the start of the march, a contingent of several organizations advocating for issues affecting the Asian community in Seattle, the U.S. and the world gathered on 23rd Ave. outside of Garfield High School at the starting point of the march. Members of the contingent of organizations advocating for issues affecting the local, national and international API community lead chants like “Hey Trump, can’t ya see, bombs don’t bring democracy,” during Seattle’s MLK, Jr. Day March, on Jan. 21, 2019. Photo by Grace Madigan. 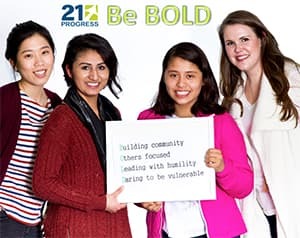 One such organization was Gabriela Seattle, a grassroots organization dedicated to fighting for national democracy in the Philippines and greater womxn-specific issues, ranging from reproductive rights to the “national and international economic and political issues that affect womxn,” according to their website. 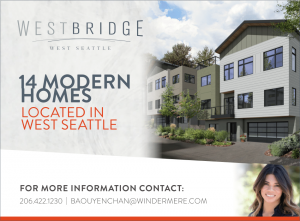 Alongside them were members of South Seattle-based organization Got Green, which advocates for environmental, racial and economic justice for low-income communities and communities of color. Also present was FIGHT (Formerly Incarcerated Group Healing Together), an advocacy group formed by formerly incarcerated API men, and Anakbayan, a national organization of Filipino Youth and Students looking to advance the causes of national democracy. “These are pieces of legislature and financial resources that go toward continued militarization in the U.S., Philippines, Venezuela, Palestine and all over the world; resources, time, and effort that could instead confront in the root causes of government shutdown and the lack of social services for the people are being used against the people for imperialist plunder,” said Anakbayan and Gabriela Seattle in a statement about the causes of their movement. 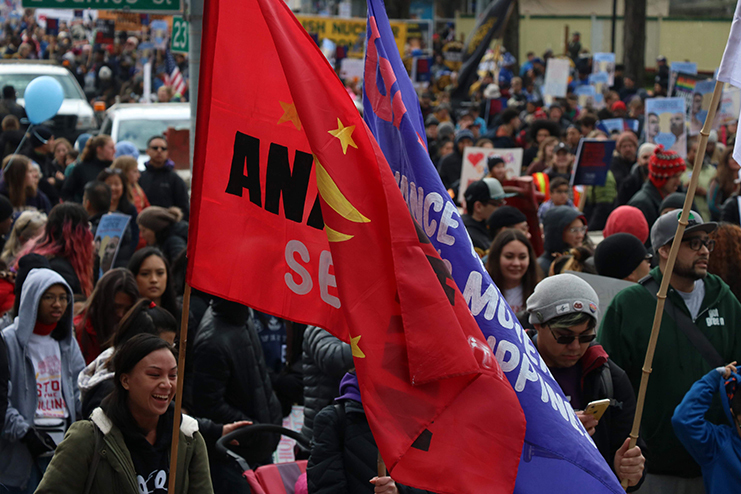 The flags of Anakbayan and Gabriela Seattle rose high above a sea of marchers during the MLK, Jr. Day March which traveled from 23rd and Jefferson St, to downtown Seattle. Photo by Grace Madigan. The groups present had multiple but overlapping causes. Individually, they advocate for those within their own communities but as a whole they stand up against capitalist and imperialist causes which derail a range of communities in the U.S. Many of these groups collectively protested the recently proposed policy that would allow thousands of Vietnamese refugees to be deported, the potential construction of a new youth jail, high incarceration rates that are affecting those in their communities and the rights for youth at the border. These are just a few of the many larger causes each group advocates for. 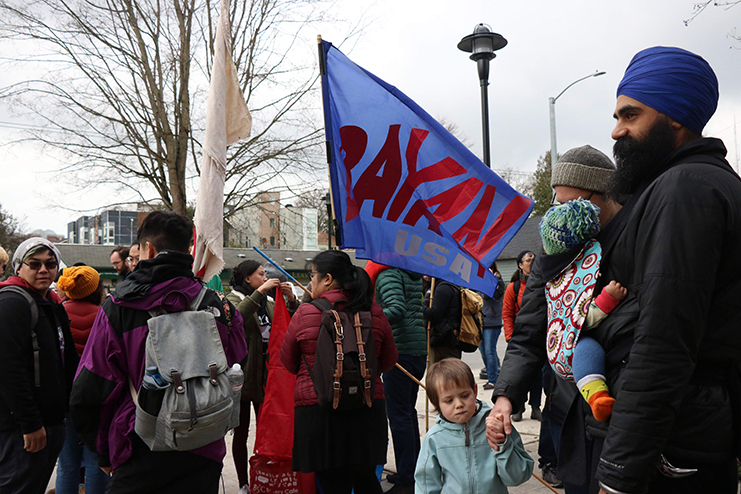 Oloth Insyxiengmay, an advocate in Seattle’s API community and a founder of the Asian Pacific Islander Cultural Awareness Group (APICAG) at Clallam Bay Corrections Center, marches among the crowd at the MLK, Jr. Day March on Jan. 21, 2019. Photo by Grace Madigan. Community members present at the march expressed similar sentiment, that there is a need for greater activism and engagement with the surrounding community, not just within the API community, but others as well. 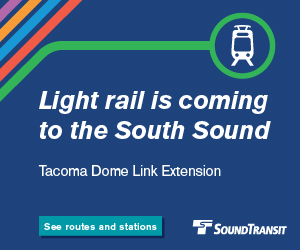 “I think we’re really trying to build a lot of international solidarity with black and brown folks,” said Lori Penor, chair of Gabriela Seattle. A few members from Gabriela Seattle brought along their own children, who were pushed in strollers surrounded by the purple and white signs of the Gabriela cause. The marchers surrounding those children spoke about working together to leverage their activism, which ideally draws as many people to the streets as possible. 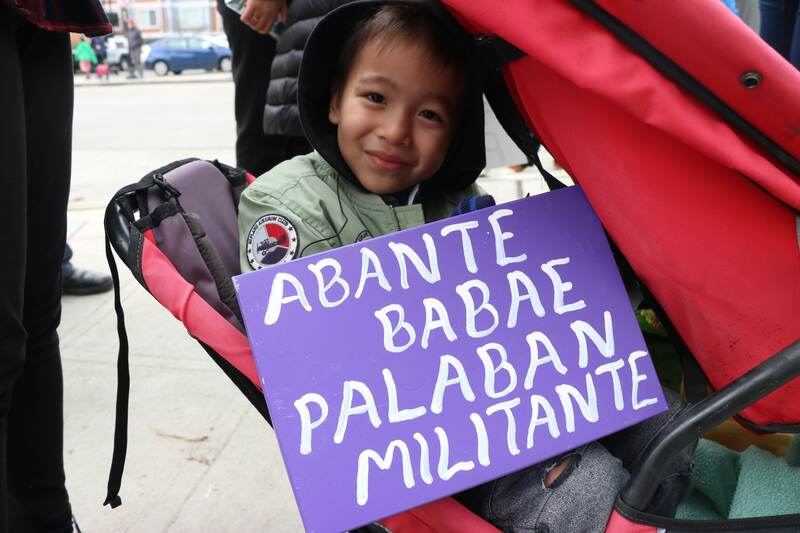 The son of a member of Gabriela Seattle holds a purple and white sign representing the movement during the MLK, Jr. Day march on Jan. 21, 2018. The sign reads “Advance women, fight militantly,” one of the group’s key chants. Photo by Grace Madigan. 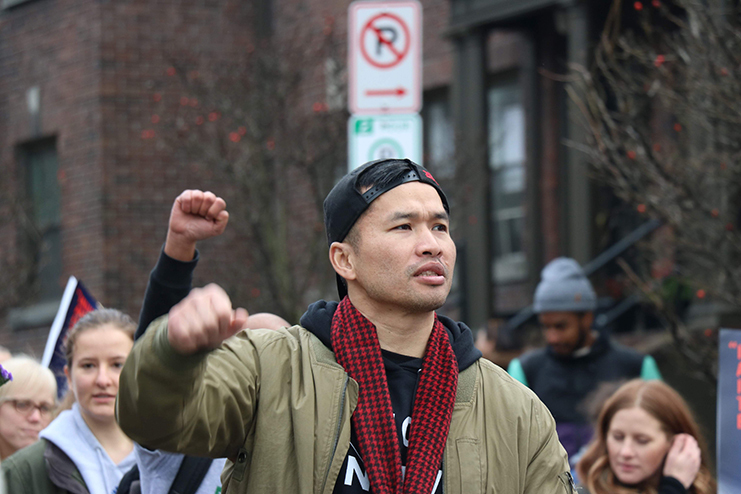 “Unless it comes to your front door, people don’t get it and people don’t understand,” said Insyxiengmay about how issues like deportation, incarceration and poverty all touch the community he’s from, but for many it takes a direct impact to spark activism. 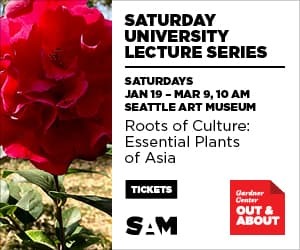 Gabriela Seattle and Anakbayan are looking to mobilize new community members by organizing more workshops, events and panels, encouraging those that are impacted to tell their stories. 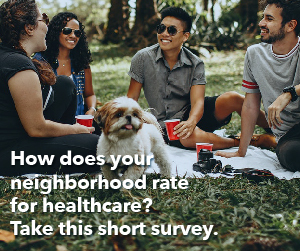 They see solidarity in community — locally, nationally and internationally. Alongside the groups and the chants on 23rd Avenue stood some marchers observing the sea of causes before them. 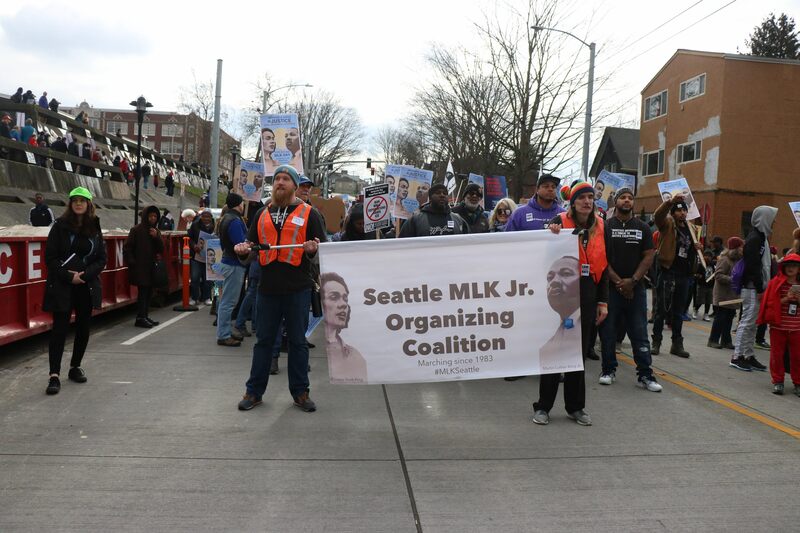 Outside of Garfield High School, on 23rd and Jefferson St, community members began the MLK, Jr. Day March, which would continue to downtown Seattle, uniting causes from all over the city. Photo by Grace Madigan. 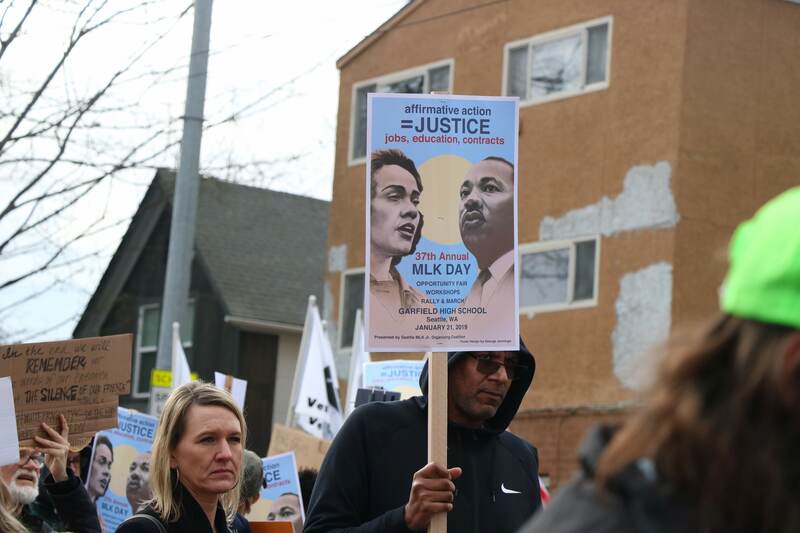 Garfield High School hosted panels, workshops, an opportunity fair and more to bring together various causes and people in the community before he MLK, Jr. Day March began on Jan. 21, 2019. Photo by Grace Madigan. The March for MLK, Jr. Day brought together members from all over the community, three men here wear buttons that say “Love will drive out hate,” that were passed out throughout the day. Photo by Grace Madigan. A member of the MLK, Jr. Day March raises his fist and a sign advocating for justice amongst the crowd. 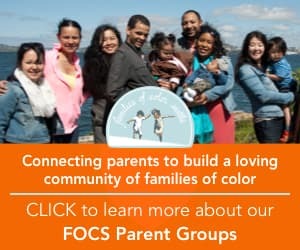 This year’s march was dedicated to backing Initative 1000, which would “redefine affirmative action in Washington, providing equal opportunities through recruitment, hiring, outreach, training, goal-setting and other methods designed to increase diversity,” according to their website. Photo by Grace Madigan. 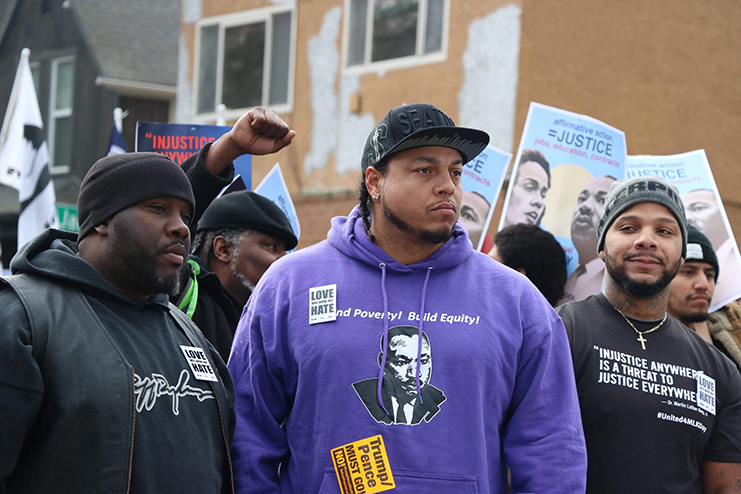 Two marchers look towards members of the organizations advocating for local, national and international API communities and leading chants, during the MLK, Jr. Day March on Jan. 21, 2019. Photo by Grace Madigan.